Tzaneeen is becoming one of the noted mountain biking destinations in South Africa – an ideal springboard for both novice and accomplished mountain bikers to practice this sport in a secure environment amidst breath taking scenery. 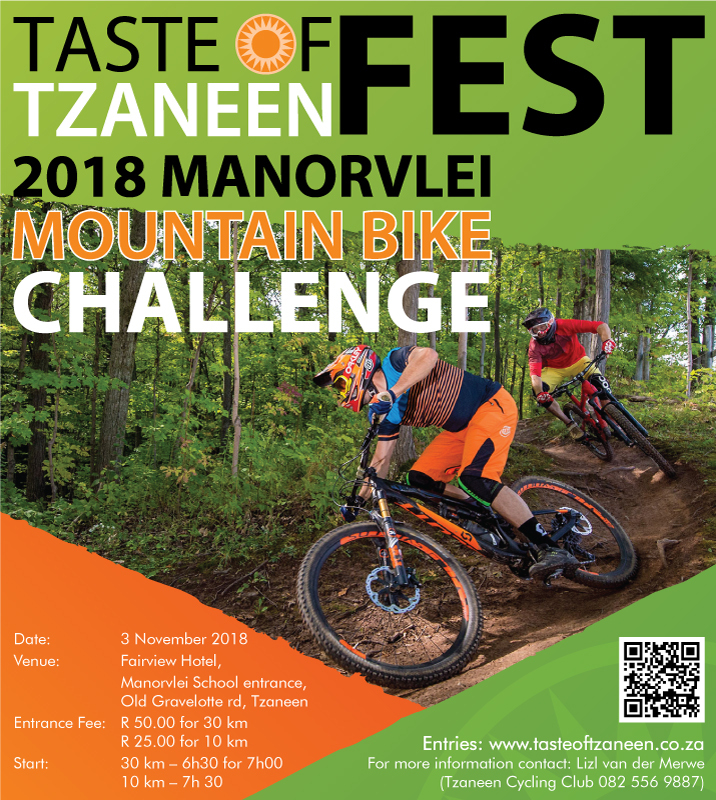 The Manorvlei Mountain bike challenge is a new event, which forms part of the annual Taste of Tzaneen Fest, which is held at Fairview Hotel in Tzaneen, on Saturday 3d November 2018. This intermediate return ride is taking place on the neighbouring farm, Manorvlei, a working avocado farm, offering both the competitive and the casual mountain biker a well-marked, mountain bike trail. The 30 km race starts on Saturday morning, at 06h30, and bikers can enjoy a challenging outride with an elevation of almost 375 m.
It is a trail of medium length. The start is very easy and snakes along the neatly tarred farm road, passing farm dams, avocado and banana orchids along the way. The road changes into a narrower road, take you underneath the R 71, and wind upwards towards the Deerpark area. Forest areas and scenic views over the beautiful Tzaneen Dam makes this steep climb of 15 km worth the while. The route should be taking between 1,5 and 2,5 hours from start to end and promise not to disappoint. A 10km funride ride will start at 7h30 and can be enjoyed by the more relaxed cyclists.